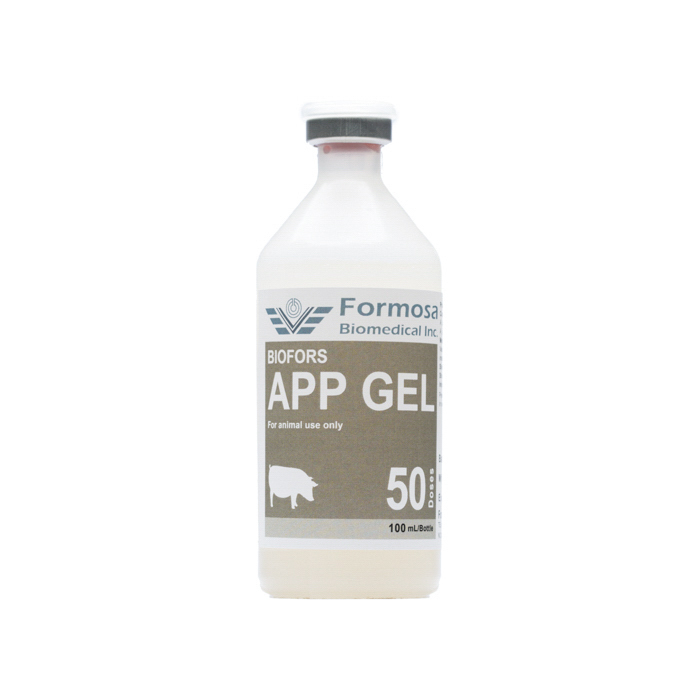 BIOFORS APP GEL is a biological product containing inactivated A. pleuropneumoniae type 1 and type 5 with aluminum hydroxide gel added as adjuvant. Prevention of Swine Actinobacillus pleuropneumoniae infection in pigs. Shake to mix thoroughly before use. Administer 1-2 doses (2.0-4.0 mL) to each pig via intramuscular injection. Store in a dark place at 2-8°C. Do not freeze. ·Follow the instructions from and use under supervision by a veterinarian. ·Do not vaccinate pregnant sows. ·Observe the health status of each pig. Do not vaccinate pig showing unusual symptoms. Vaccinate healthy pigs only. ·Use equipment sterilized by autoclaving for vaccination only.Do not sterilize with alcohol instead. Vaccination sites should be sterilized by rubbing with 70% alcohol swap. ·Do not save unused vaccine for later administration. Sterilized unused vaccines and vaccine containers by autoclaving before disposal.